The sturdy opening of the G major quartet, No 5, with its flicking ‘Scotch snap’ rhythms, points the way to the more egalitarian textures of the famous Op 20 set by quickly involving all four instruments in the motivic interplay. Then, near the end of the exposition, Haydn gives Tomasini his head in a bravura passage of double-stopping. To offset the expansive development, ending with a quasi-improvisatory passage for solo first violin, the recapitulation drastically compresses the events of the exposition. The tangy minuet, full of metrically disruptive canonic imitations, encloses an inscrutable G minor trio that leads back without a break into the minuet. G minor is also the key of the Adagio, where the first violin impersonates an imploring opera seria heroine in alternating arioso and recitative, the latter uncannily foreshadowing the finale of Beethoven’s Ninth Symphony. 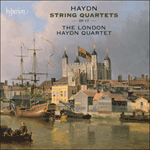 Haydn exploits the catchy theme of the finale, given a gentle rhythmic ‘kick’ by the viola, with impish wit, right through to the conspiratorial pianissimo ending. Avec ses vacillants «rythmes lombards», la robuste ouverture du quatuor en sol majeur, no 5, pave la voie aux textures plus égalitaires du fameux corpus op. 20 en impliquant rapidement les quatre instruments dans le jeu motivique. Puis, vers la fin de l’exposition, Haydn lâche la bride à Tomasini dans un passage de bravoure en doubles cordes. Pour compenser le développement expansif, qui s’achève sur une quasi improvisation du premier violon, la réexposition comprime drastiquement les événements de l’exposition. Le menuet corsé, gorgé d’imitations canoniques métriquement perturbatrices, renferme un insondable trio en sol mineur qui ramène sans transition au menuet. 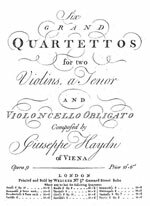 Sol mineur est aussi la tonalité de l’Adagio, où le premier violon se prend pour une implorante héroïne d’opera seria alternant arioso et récitatif, lequel préfigure étrangement le finale de la Symphonie no 9 de Beethoven. Haydn exploite le thème accrocheur du finale, avec un doux «kick» rythmique à l’alto, à la verve espiègle, jusqu’à la conspiratrice conclusion pianissimo. Der solide Anfang des G-Dur-Quartetts, Nr. 5 mit seinem schnalzenden „Scotch snap“ oder lombardischen Rhythmus weist den Weg zu den egalitäreren Texturen der berühmten Sammlung op. 20, indem alle vier Instrumente schnell am motivischen Wechselspiel beteiligt werden. Gegen Ende der Exposition gibt Haydn dann in einer bravurösen Doppelgriffpassage Tomasini nach. Zum Ausgleich für die expansive Durchführung, die mit einer quasi improvisatorischen Passage für Solovioline endet, verdichtet die Reprise die Vorgänge der Exposition. Das herbe Menuett voll metrisch zerrissener kanonischer Imitationen umschließt ein unergründliches g-Moll-Trio, das ohne Unterbrechung zum Menuett zurückführt. G-Moll ist auch die Tonart für das Adagio, wo die erste Violine mit abwechselndem Arioso und Rezitativ eine flehende Opernheldin verkörpert—Letzteres weist frappierend auf das Finale von Beethovens Neunter Symphonie voraus. Haydn nutzt das eingängige Thema des Finales, das einen sanften rhythmischen Anstoß von der Bratsche erhält, bis zum konspiratorischen Pianissimo-Schluss mit schelmischem Witz.